Subtropical Depression Alberto will pull away from the area and be replaced by an upper level ridge. 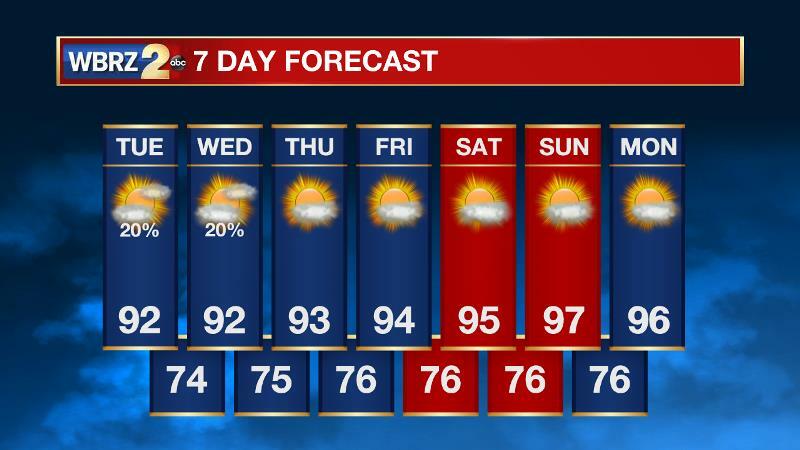 This will mean lower rain chances and higher temperatures for the end of the week. The Tropics: Subtropical Depression Alberto was positioned 30 miles west of Montgomery, Alabama on Tuesday morning with a minimum central pressure of 995mb and maximum sustained winds of 30mph. The system was moving north at 13mph and will accelerate as it moves farther northward and weakens. Alberto will become a remnant low by Tuesday evening before reaching the Ohio Valley by midweek. Today and Tonight: Mostly sunny skies will start your Tuesday with clouds building late morning into the afternoon. Spotty showers are possible until about 7pm. Highs will climb into the low 90s, with overnight lows dropping into the mid 70s. Up Next: Subtropical Depression Alberto will move north into Tennessee and Kentucky through Wednesday, leaving just enough moisture behind for isolated showers and thunderstorms across the Gulf States. Daytime warmth will still be needed to trigger any action. Rain chances will slowly diminish over the next several days with very little activity left around Thursday through Saturday. Temperatures will continue to warm as this drier trend emerges. High pressure will build to the west in Texas and infiltrate east into Louisiana and Mississippi by Thursday. Warming high temperatures are expected through the mid and possibly upper 90s this weekend. With continued humidity, the National Weather Service may need to post the first heat bulletins of the season. Subtropical Depression Alberto will still have a small influence on the local weather through Wednesday. Isolated showers and thunderstorms will develop in response to daytime heating and the broad circulation around the storm. Coverage of showers and thunderstorms will diminish by Thursday as a ridge builds across the region in the upper levels leading to subsidence and therefore warming, drying conditions. This will mean high temperatures can climb into the mid 90s and will work with the high dew points transported poleward by Alberto to produce very uncomfortable feels-like temperatures. Rain chances will be effectively shut down on Saturday and Sunday so highs will respond by climbing into the mid and upper 90s, possibly prompting the need for heat alerts. Forecast models are hinting at a trough and subsequent weak cold front for early next week that would increase rain chances and knock the heat back a few pegs. Such a change after very high heat would mean a collision of air masses that could result in some stronger thunderstorms. We’ll keep an eye on that for the Sunday/Monday timeframe.